English National Opera has saved the newest until last as it ends its summer season with a world premiere. Contemporary composer Nico Muhly’s Two Boys, which is co-produced with the New York Metropolitan Opera, is based on a true story. When Detective Inspector Anne Strawson investigates the (near) murder of one teenager by another she is driven into a sinister world of internet chat rooms and cybersex. As she has no experience of these, she struggles to conduct her enquiries in the face of the secret agents and teenagers with wisdom beyond their years that rear their ugly heads. In Bartlett Sher’s production, it is possible to pick holes in the music, the direction and the storytelling, but none of these difficulties prevent the evening from being engaging to an extent. Muhly’s music, in which eerie, haunting phrases are frequently raked over again and again, is interesting but can feel underwhelming and derivative. 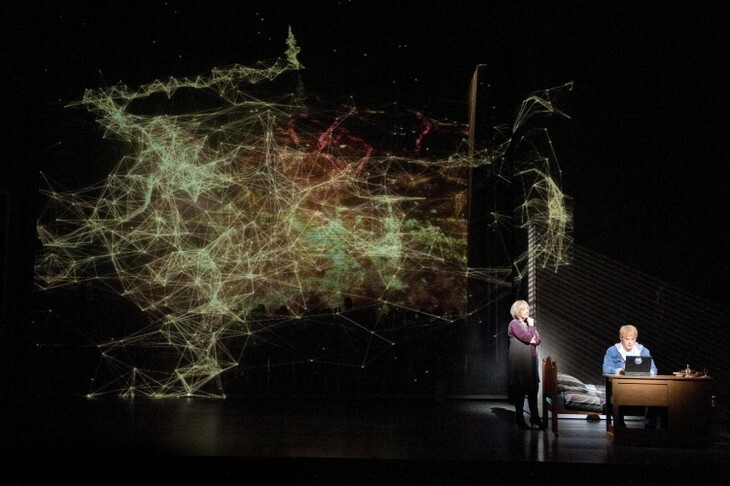 Michael Yeargan’s sets are reasonably effective, with tall towers containing staircases and screens providing pictorial depictions of cyberspace, courtesy of Fifty Nine Productions. When, however, these are occupied with hoards of static people, staring at their laptops and repeatedly chanting the same phrases, the atmosphere can seem undercharged. The main success lies in the way that we are drawn into the story, so that we eagerly await every new twist or turn. Even here, however, characters are developed almost entirely by verbal exchanges that make the necessary points, while the ending is disappointing. When we finally discover what has happened, it feels like we are simply witnessing good old-fashioned fantasising, albeit with a contemporary twist, rather than our modern dangerous world in action. There is no disputing the strength of the cast, which includes Nicky Spence, Mary Bevan, Jonathan McGovern and Joseph Beesley as the teenagers, Susan Bickley as the Detective Inspector and Heather Shipp as the mysterious agent. Two Boys does hold some appeal, even if that ultimately proves to be a little limited.